Karbi cultural society president Chandra Sing Kro (Left) , Karbi Lammet Amei president, Suren Kramsa(middle) and Hills Tribal League Chairman, Soising Rongpi address the Press conference at Diphu on Tuesday. Photo:Northeast Now. A joint delegation of Karbi Lammet Amei (KLA), Karbi Cultural Society (KCS) and Hills Tribal League (HTL) will meet the Chairman of National Council of Registrar of Scheduled Tribes and Schedule Caste in India (NCRSTSCI), Nandh Kumar Sai on December 7 in New Delhi to oppose Clause 8 of the Bodo Accord. “The Karbis are demanding the Autonomous State under Article 244 (A) which is there in the Constitution, but the Central government is giving more privilege to Bodos. The Central government is more concerned with the 30,000 Bodo populations in Karbi Anglong than the cause of the Karbis demanding for autonomy,” he said. He also pointed out that Ramesh Oram, when he was chairman, NCRSTSCI on November 17, 2015 had come to Diphu regarding Clause 8. Leaders of various social organisations including KCS, KLA and HTL met Oram on that day and urged him not to recommend for the implementation of Clause 8 by Central government for granting ST (H) status for Bodos of Karbi Anglong and NC Hills. 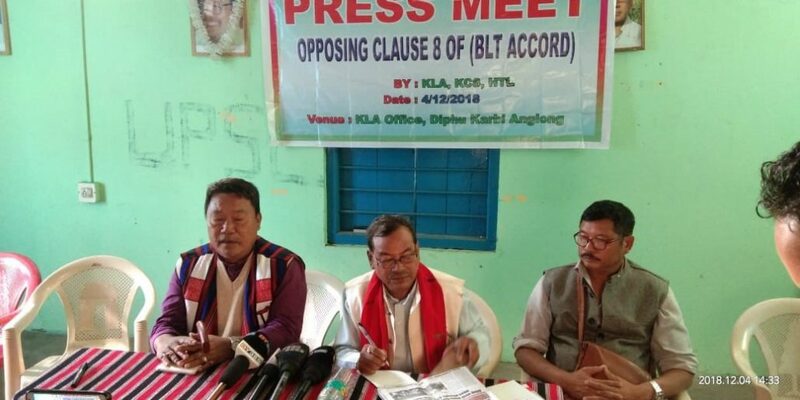 “We are also preparing to hold a massive rally in Diphu to oppose the implementation of Clause 8 of Bodo Accord and if the government does not listen to us then there may be constitutional crisis,” Kramsa said.